Langshi Sceneries A boat trip from Guilin along the Lijiang River presents one of the finest excursions on your tour of China. The journey downstream to Yangshuo offers 30 miles of breathtaking scenery. 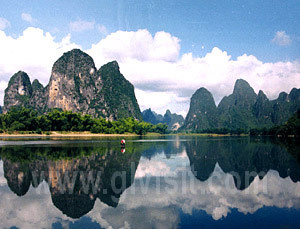 You will enjoy the picturesque mountains on the 4.5 hours wonderful cruise and then visit some parks in Yangshuo. Coming close to the Erlang Gorge, a huge cliff comes into view. This is the famous "Picture Hill" that resembles horses of different colors in different positions. Huangbu (Yellow Cloth) Beach Here the river is wide and flows gently. Seven graceful peaks are likened to seven quiet young girls standing shoulder to shoulder. Xingping Xingping is a famous, ancient town. Shutong Hill The cruise ends at the colorful market town of Yangshuo. Yangshuo Nice View Garden The park l ocated in the southeast of Yangshuo city, there are a great number of stone carvings. 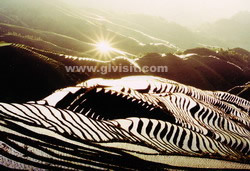 The representative one is a big carving in Chinese characters, which contains some phases means there are grand rivers and mountains, it is unique in the world, young man works hard and leaves a good name for a hundred generations. 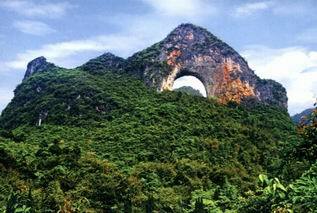 One kilometer to the south of the Big Banyan Tree, there lies the Moon Hill. On the upper part of the hill, there is a round through cave which looks very much like the moon when it is against the blue sky. Shangri-La, a beautiful landscapes kingdom of Guilin, is located not far away Yangshuo (by bus fro ten minutes) along Guiyang Road. Just like a naïve maid, it is naïve and natural. Price include: 1 Private English speaking tour-guides. 2 Private air-conditional car :Santana 2000, Audi or same grade. 2 Tips to guide and driver. 3 Hotel, breakfast and dinner expenses. 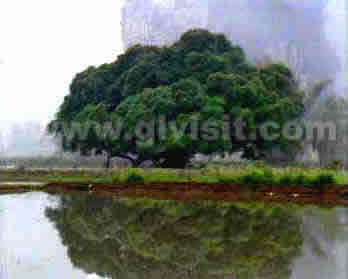 4 Entrance fee for Yangshuo scenic spots.